Place the avocado in a small bowl and sprinkle with 1 teaspoon lime juice. Set aside. Place the shrimp in a small bowl and add the olive oil and salt. Toss to coat. Arrange them on the press and cook until pink and just cooked through, 2 to 3 minutes. Carefully remove them and set aside. When cool enough to handle, cut them into 1-inch pieces. Place the mango, scallions, cilantro, pepper flakes, and remaining 1 tablespoon lime juice in a medium bowl and toss to combine. 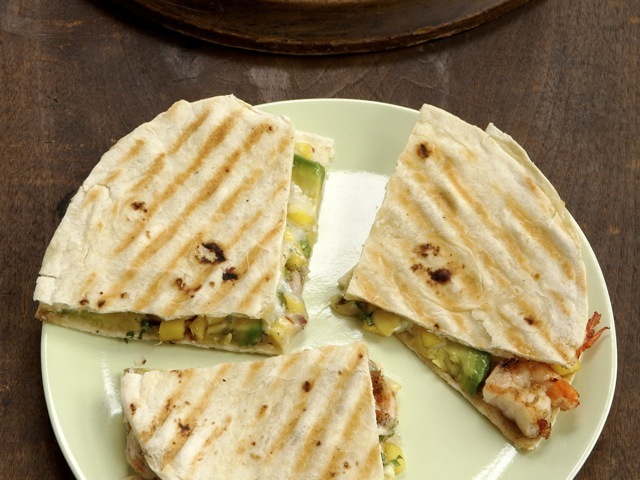 Arrange the avocado on one half of each flatbread. Arrange the shrimp on top of the avocado. Spoon the mango salsa on top of the shrimp. Sprinkle with the grated cheese. Fold the flatbreads over. Put the sandwiches on the press, pull the top down, and cook until they are browned and crisp, 3 to 6 minutes, depending on how hot your machine is. Carefully remove from the press and serve immediately.